AEJ and I flew direct from LA to JFK, so the flight wasn’t that bad — about 5 hours. We were tired, but neither of us can sleep on a plane. 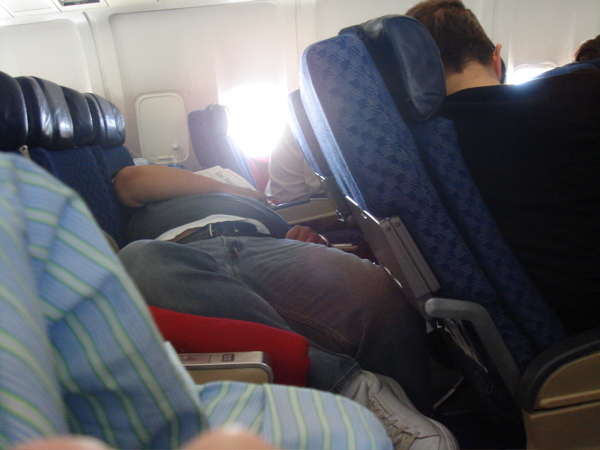 The guy next to us, though, had no such problem. Yes, the newspaper is resting on his face. Newman and Melissa picked us up at the airport, saving us the $50 cab ride. Back at his place, Newman got to work on his side job of taking phone orders for Victoria’s Secret. 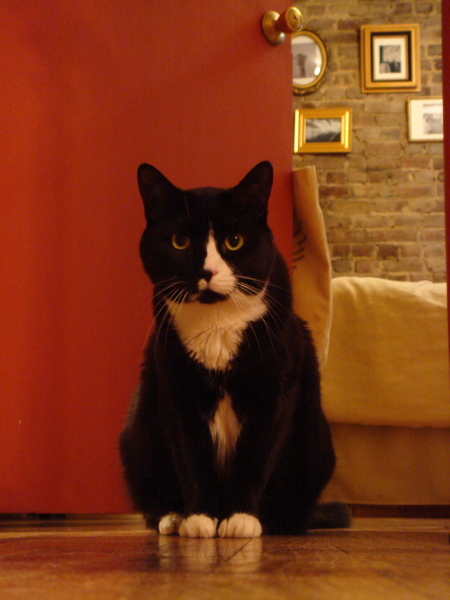 This is one of their cats. Say hello, kitty. After settling in a bit, we headed to dinner at a great Chinese place in their neighborhood. I love Chinese food, but it’s strangely hard to come by in our neighborhood back in LA. Newman, always the courteous host, had purchased this bunch of “bananas” for us. This picture is not color-enhanced. This is actually the color of the “bananas.” We thanked him graciously, but politely refused his offer of nuclear bananas. The next morning, we got breakfast at a cute little place a few blocks from their apartment. I had this delicious (and huge) slice of coffee cake. Then AEJ and I headed uptown. 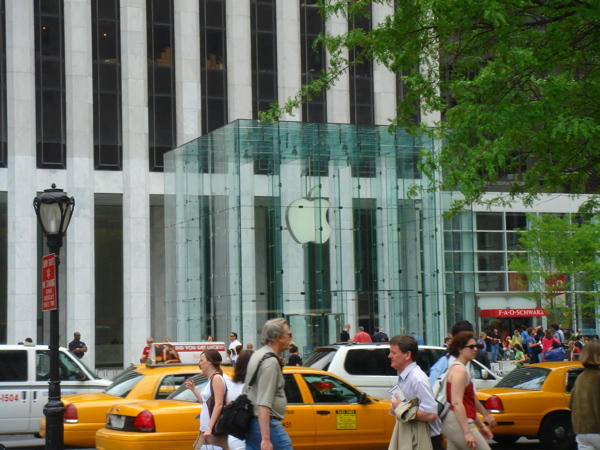 Our first stop: the new Apple Store on 5th Avenue. The whole store is underground, but much of the ceiling is open to the street level above, via this enormous glass cube. 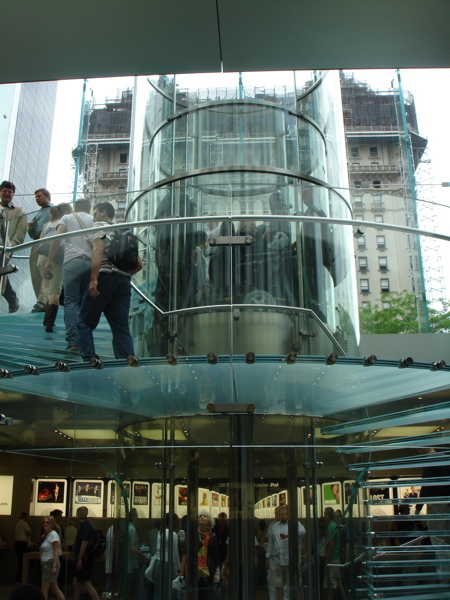 You walk in and either descend the curved glass staircase, or take the clear, round, glass elevator down a floor to the store itself. Here’s a shot from the store, looking up through the glass floor. 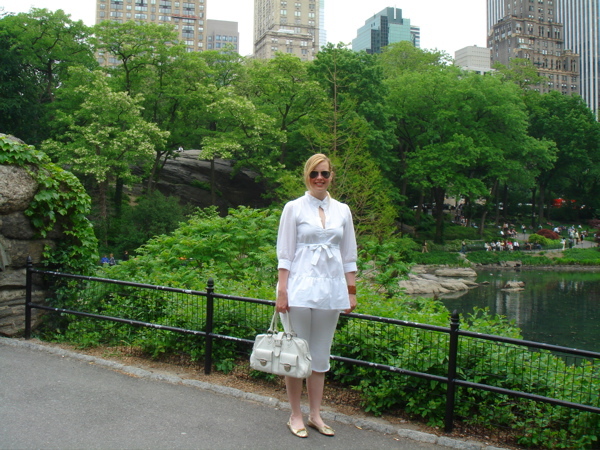 We wanted to see our old neighborhood, so we walked through Central Park. Here’s the lovely AEJ. 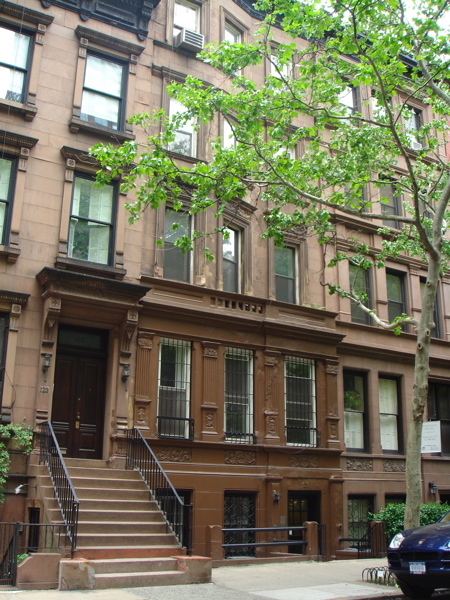 This is my old building. It looks exactly the same. Some things did change, of course. 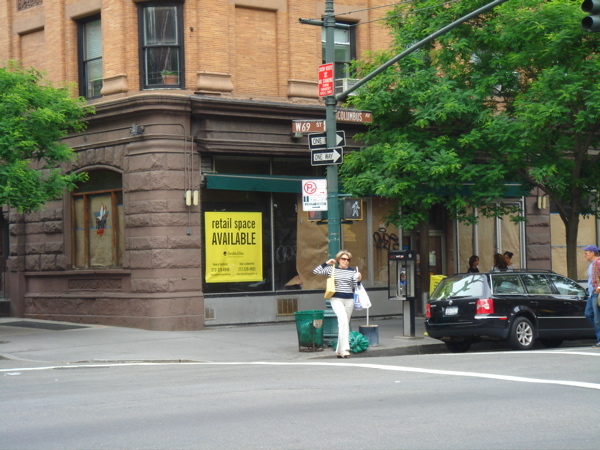 This used to be Caprice Cafe, a regular stop for drinks with Robert Battle. Robert always used to drink free there, because whenever he’d go, he’d bring a gaggle of beautiful young female dancers with him. The owner rewarded Robert with free drinks, which, as far as I can tell, given Robert’s love of Jack & Soda, put the restaurant out of business. Lunch was at a tapas place just a few blocks from the old apartment. Fortunately, the place is still open, and they still serve the most delicious empanadas. That night, we went to Lincoln Center to hear Steve Bryant‘s new orchestra piece, “Alchemy in Silent Spaces.” The two outer movements are essentially orchestra transcriptions of Steve’s original work for wind ensemble. The new middle movement is for solo flute and strings alone. It’s a stunner. I love the first movement in its original scoring, but with full orchestra, the piece just glows. And wow, Steve has tremendous courage. For minutes and minutes, the piece seems to be static and almost motionless with the occasional splash of color, and then, the strings finally really come in with everybody else, playing this gorgeous major7 chord, and it’s scored in an amazing way that makes it feel like clouds have parted, and the biggest, most beautiful flower you’ve ever seen has just bloomed before your eyes. When I describe it, it sounds cheesy, but it couldn’t have been more authentic and gorgeous. The middle movement was equally beautiful, but with only one hearing, I’m reluctant to write much about it — but I loved it. It went back and forth between hints of Mahler and Corigliano-flavored harmonies. It’s exactly the kind of music I wish I could write. The last movement is the big barn burner, and the crowd ate it up. Bravo, Mr. Steve. 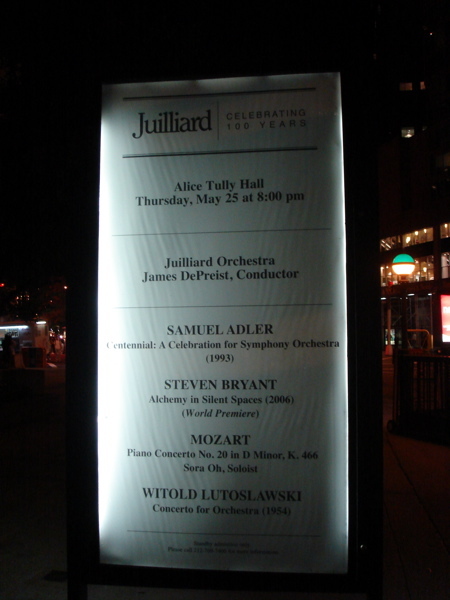 So, that’s the poster, hanging out there at Lincoln Center. Impressive, right? I mean, it takes some doing to perform at Lincoln Center. It’s not like they’ll let just anybody in. No, you have to be truly talented, and have something special and unique to offer the music world. Or, you have to have appeared on American Idol. 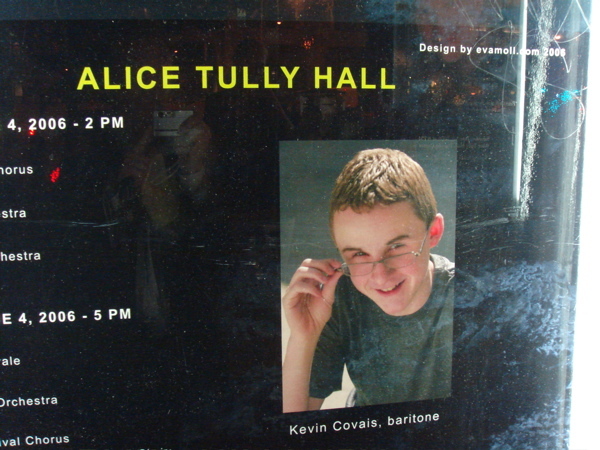 Yeah, that’s Kevin Covais, AKA “Chicken Little,” recently of American Idol “fame.” He’ll be singing with the Metropolitan Youth Symphony. And I won’t be going. AEJ and I had to leave the concert at intermission to make our way to dinner at Jean-Georges, our favorite (and, I think the highest-rated) restaurant in New York. 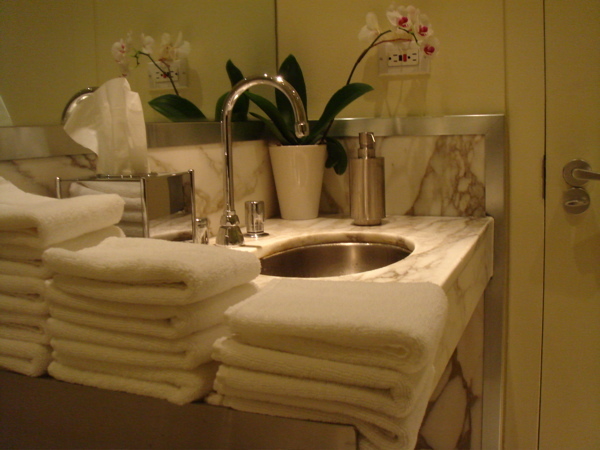 I mean, even the bathroom at this place is nice. Dinner always starts with an amuse bouche — which AEJ spelled for me. It’s like three little bites of food before the meal really gets started. Here, from right to left (that’s how you’re directed to eat it) is salmon belly sashimi, a fresh strawberry with blue cheese and dill, and then carrot soup with a layer of tarragon and passion fruit foam on top. 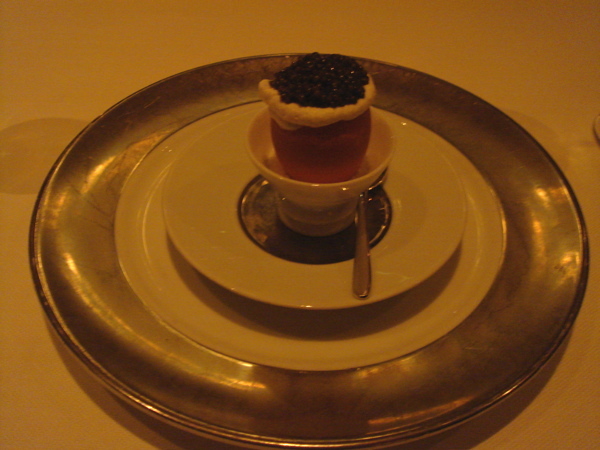 Course Number 1 : Egg caviar. I’d never had this much caviar before, and I liked it more than I expected. It tasted a lot like smoked salmon and capers. Abby’s Course Number 2 : Sea trout sashimi draped in trout eggs, lemon, dill, and horseradish. This might have been my favorite thing of the entire dinner. I’d never had trout sashimi, and to have it lemony like this, and with the crazy dill flavor (that green stripe is dill, painted onto the side of the bowl) — damn. Wow. My Course Number 2 : Sea scallops, caramelized cauliflower, and caper-raisin emulsion. 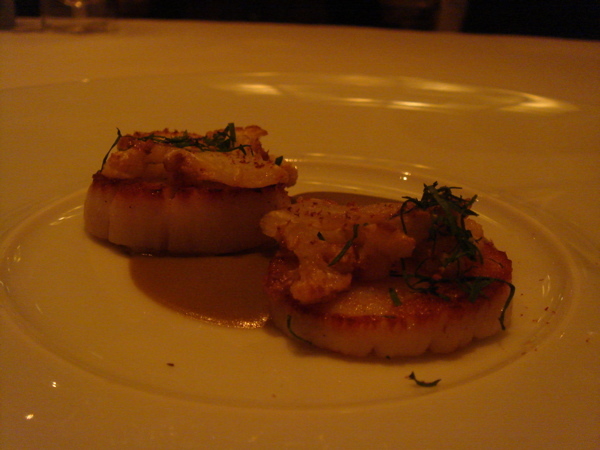 I love scallops, and these were delicious, as expected. The caramelized cauliflower was a fun touch. As I’ve written about before, one of the cool things at Jean-George is the way they serve things at the table. Jean-George says that some of the best smells occur when certain ingredients are first combined, and that usually happens in the kitchen where the diner misses it. His solution is to add broth or the base of the soup or a certain sauce right there at the table. It’s fun and theatrical, but it really does accomplish his goal of saving the first exposure to certain smells at the table. And here’s what was being served above. 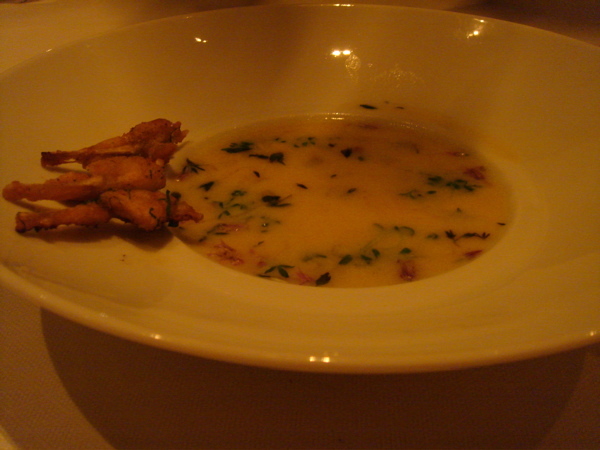 Course Number 3 : Young garlic soup with thyme, and sauteed frog legs. Good thing I was eating with AEJ, or I would have messed up at this point in the meal. 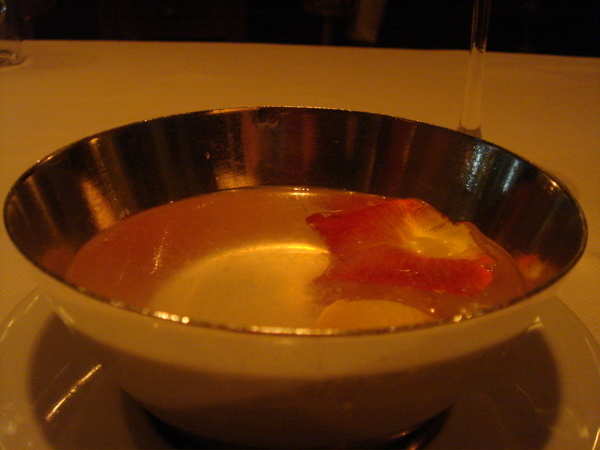 Because we’d just finished a course that used our fingers, the waiter brought these bowls of rose water. Before I could drink it, AEJ mentioned that it was intended to clean our fingers. Whew — ’cause it looked refreshing. Yum. 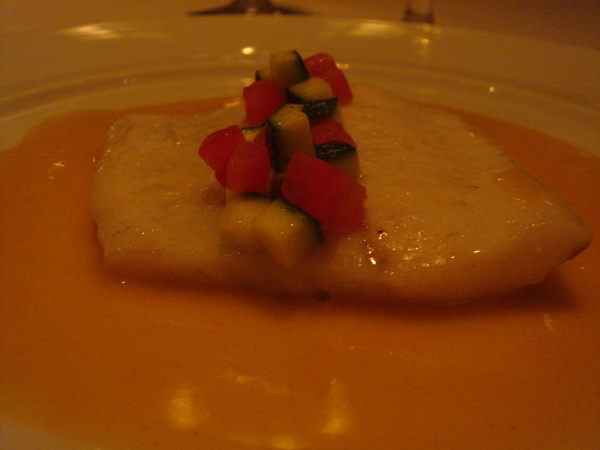 It’s Course Number 4 : Turbot with Chateau Chalon sauce. Oh boy, oh boy. 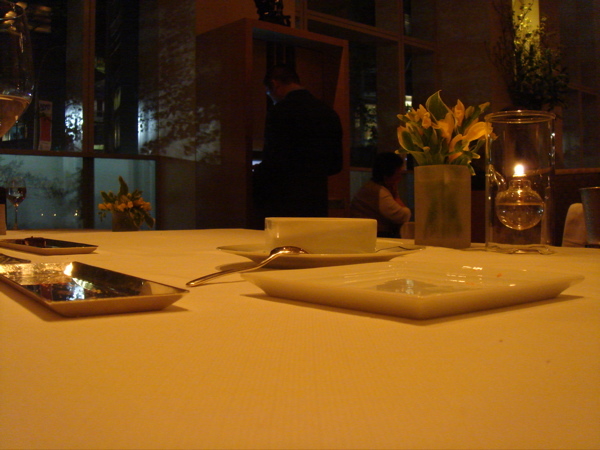 This is the course that keeps us coming back to Jean-Georges. For AEJ, it’s the best thing she’s ever eaten, and for me, it’s up at either number 1 or number 2. 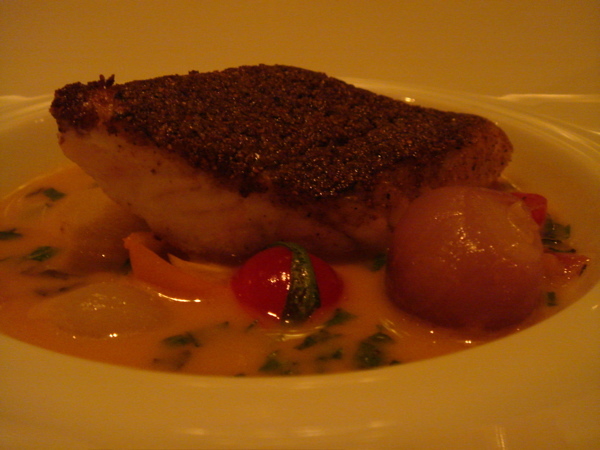 It’s Course Number 5 : Black sea bass crusted with nuts and seeds, sweet and sour jus. There’s really nothing to say about this except that I can’t recommend it enough. 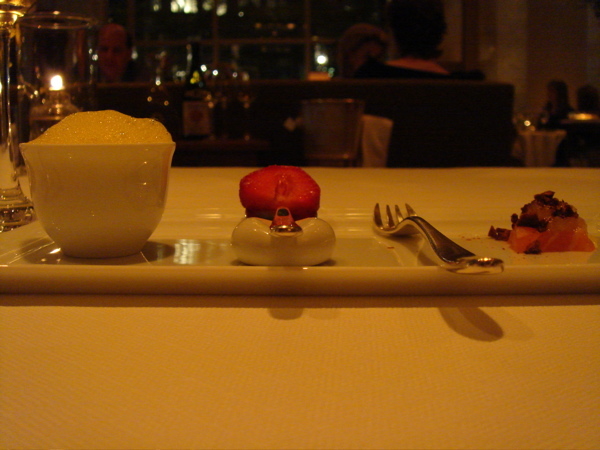 If you eat at Jean-Georges, and you order one of the big tasting menus like we did, but this course is not offered, get it as a substitution. 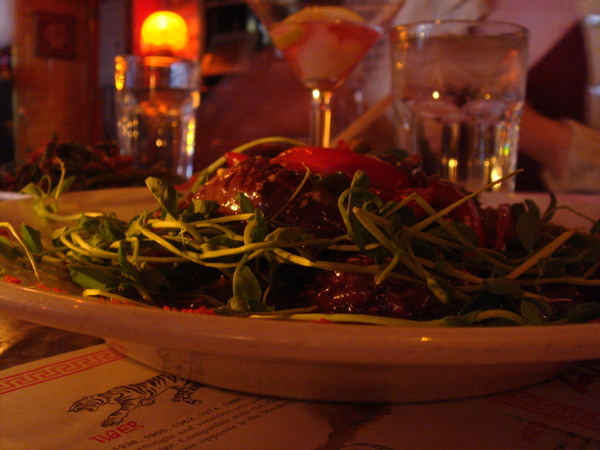 Do not leave the restaurant without trying this dish. 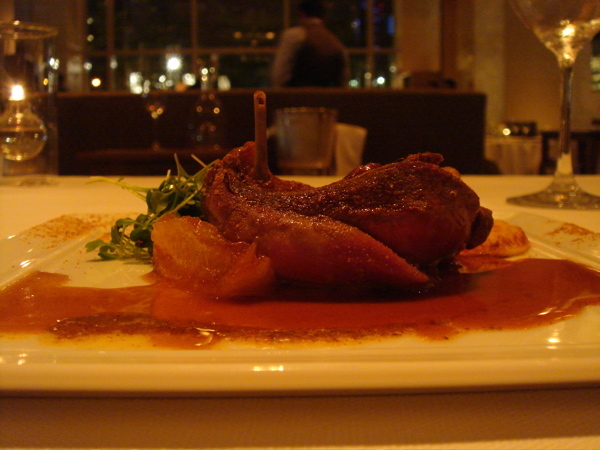 And Course Number 6 : Broiled squab, onion compote, corn pancake with foie gras. There’s a lot of meat on that tiny little bird. 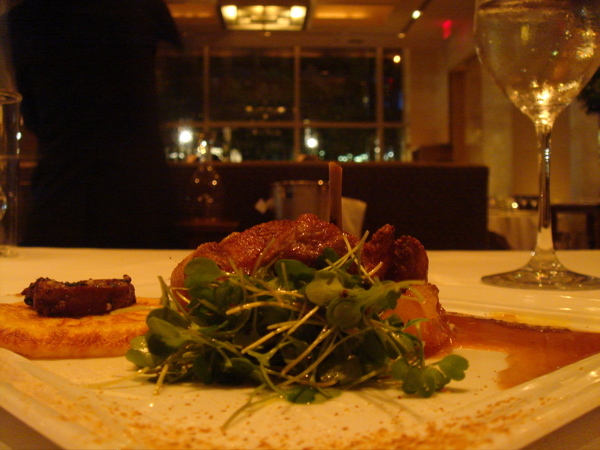 Here’s a shot from another angle, so you can see the greens and the little corn pancake with foie gras. 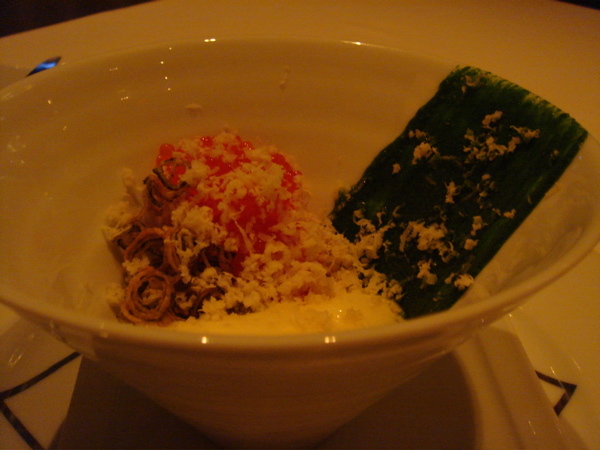 I was getting pretty full, but we still had Course Number 7 : dessert. 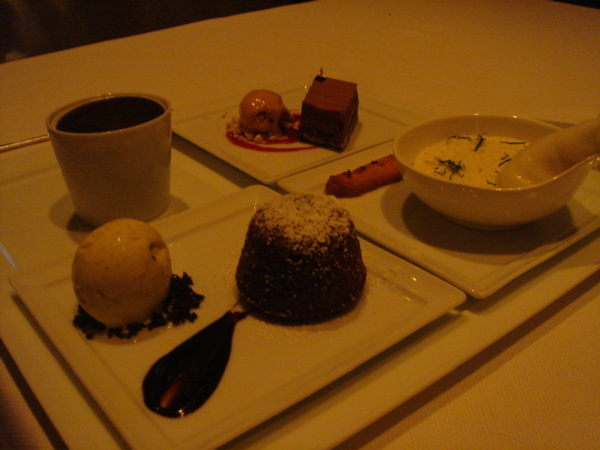 AEJ chose chocolate : Jean-Georges’ chocolate cake with vanilla bean ice cream; Granite, gelee, coffee-cardamom meringue; milk chocolate-peanut cake with salted caramel ice cream; and white chocolate, yuzu, mint, and pink peppered sable (a cookie). And I chose citrus: creme fraiche cheesecake with meyer lemon jam; bitter caramel custard (how you make caramel bitter, I’ve no idea) with grapefruit confit; kumquat strudel and chartreuse ice cream; and blood orange sorbet with tarragon. 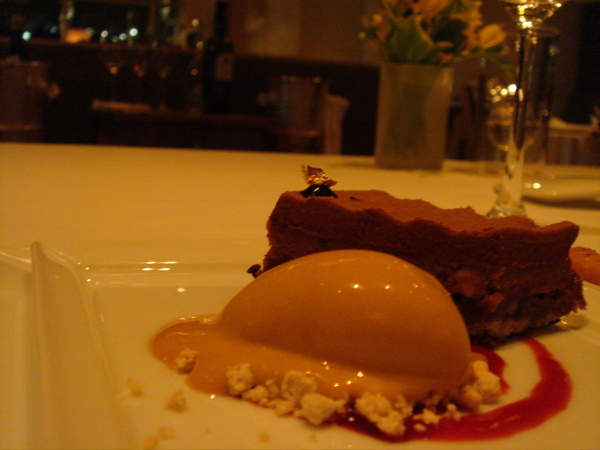 When I mentioned a few entries ago that I would be eating at Jean-Georges, Kevin Howlett wrote a funny comment about David Cross’ rant about how the gold-leaf topped chocolate dessert was the ultimate “F-you” to poor people. So, Kevin, this photo is dedicated to you. We’re done! Oh wait – we’re not. 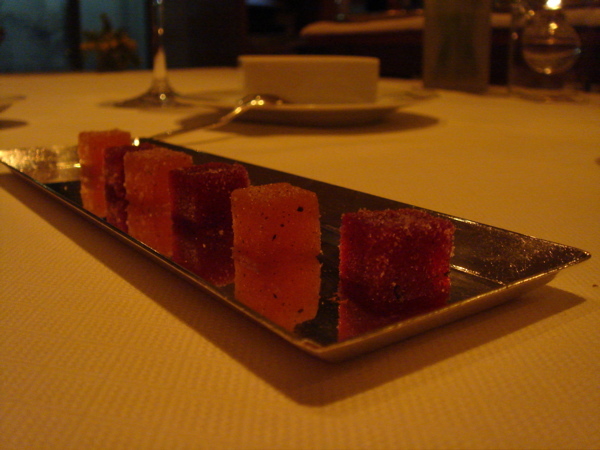 Next they brought us fresh hand-cut marshmallows (which they cut at your table), and these homemade jellies. Oh, and these little things that look like tiny candy Big Macs. And THAT was all. Dinner took about three hours. If you think of it as taking as long as dinner and a Broadway show, the price seems about right — and to us, it’s more fun. Just unbelievably delicious and fun and surprisingly casual. I mean, it’s definitely a formal restaurant, but they make it feel completely comfortable. No snootyness or attitude. Just the best food I’ve ever had. you CRACK me up. seriously, you should make a coffee table book out of your blogs. keep ’em comin! John Mackey dedicated something to ME! I’m as giddy as a schoolgirl on the way to her first cotillion. 1. I envy you for having attended the AISS premeire. 2. I envy you for having seen the NYC Apple Store. Been to the Apple Store at Southcenter Mall in Tukwila, WA? Not that exciting. 3. If you haven’t heard David Cross’ rant on Jean-Georges (and I would like to eat there someday), let me know, and I will gift it to you via iTunes. Comedy gold, baby! 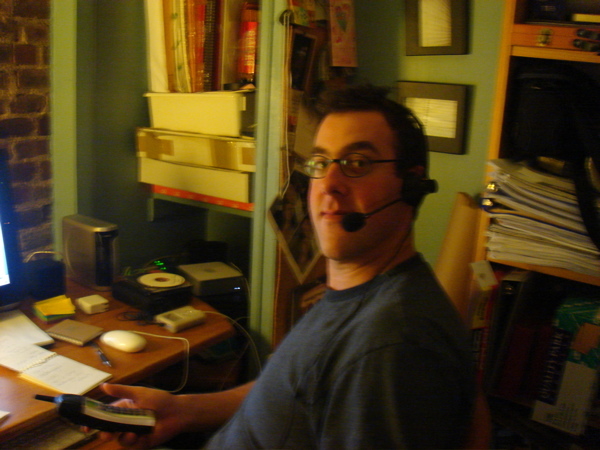 No one can do a photo blog like you, John! Sophie’s totally jealous of her sister’s fame. I remain in awe of you blogging prowess! Just imagine if Loki had opposable thumbs!! This is August.We met at the University of Kansas when we did the recording.Long time not in touch. The CD is great.Redline Tango sounds great. I hope you enjoy yourself in New York. i’m always interested in highly rated restaurants. perhaps i’m living vicariously through the upper crust, since i can’t afford eating at any of them, and the closest i’ve gotten to greatness is Ambria, which was totally snooty (unlike your time at Jean Georges). an old professor of mine recently was raving about what she had called “the highest rated restaurant in New York,” Per Se. if you’re ever looking for a change of pace, perhaps you should check it out. 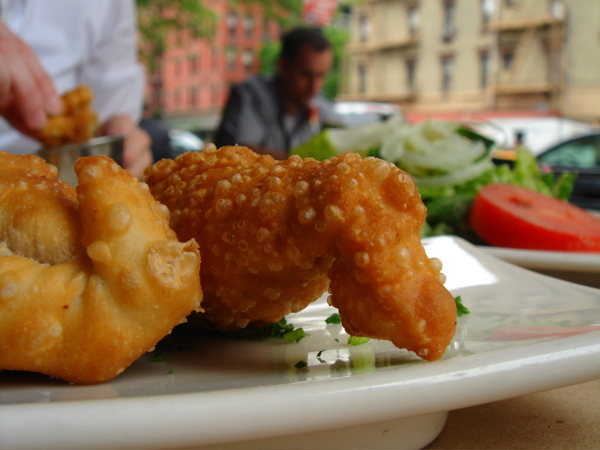 USRG has both the restaurants in the top five for New York (not surprising, really, based on descriptions). 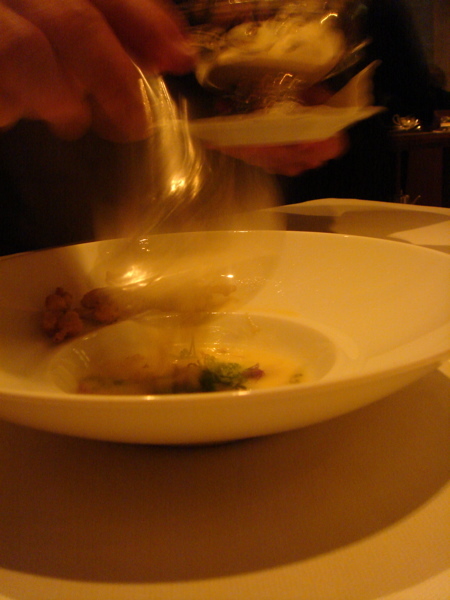 if you dig presentation, try to get into Alinea if you’re in Chicago for Midwest this year. this is the next absurdly expensive restaurant i want to go to, just because the presentations are so unbelievably imaginative (and beautiful). 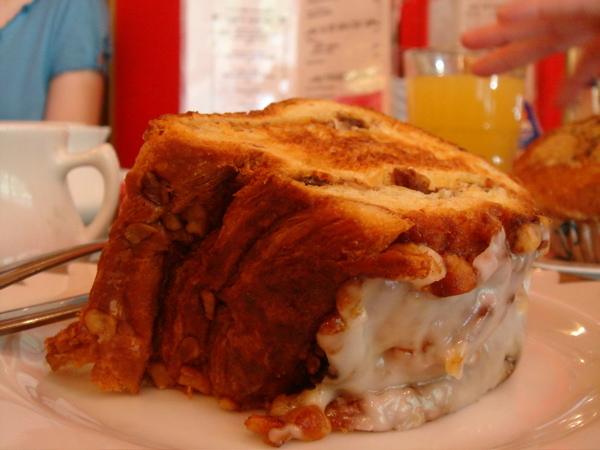 check out their photo gallery of food! Hey Mackster – excellent post. Thanks a million for the kind words about Alchemy – was so glad you and Abby could be there. BTW, I think we just missed each other at the Apple Store that day. Your posts always make me hungry. 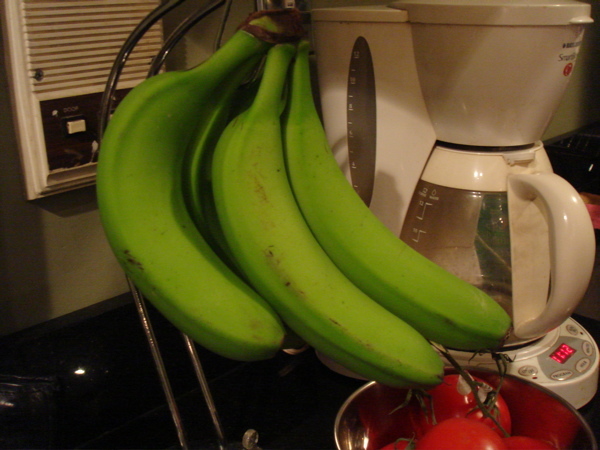 Those bananas are almost ripe now. You should come back to eat them. Great pics. 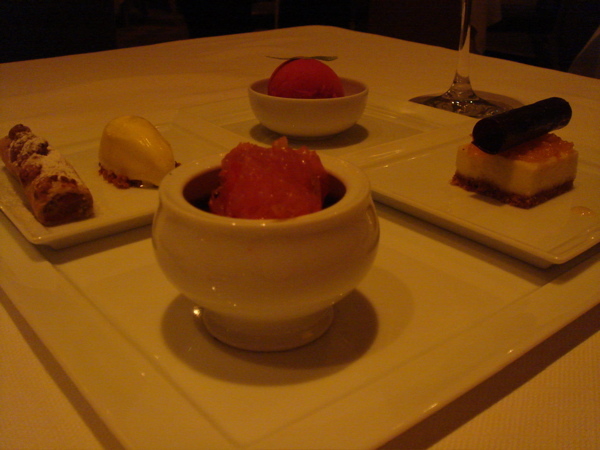 Sidenote: There are three 3-Michelin Star restaurants in NYC: Jean Georges, Per Se, and Le Bernardin. 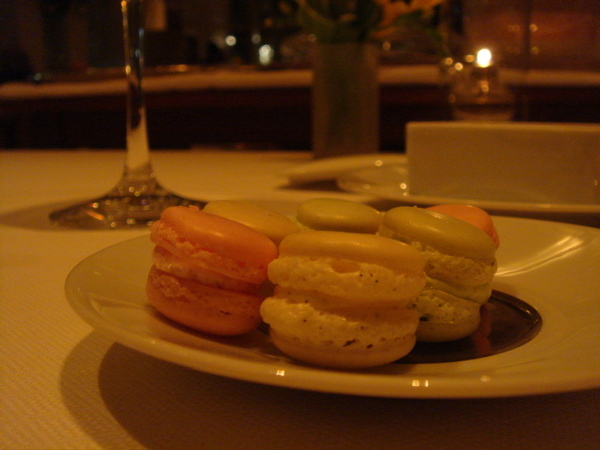 Per Se is Thomas Keller’s NYC outpost, and it $275 per person. 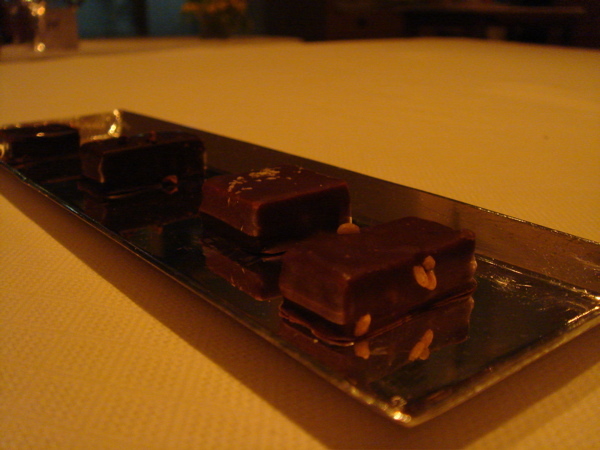 Le Bernardin is comparable in price to Jean George (chef: Eric Ripert). There’s no real ranking beyond 3 stars, so it comes down to personal preference. All are excellent, but I’d say most would agree the order is 1) Per Se, 2) Le Bernardin, and 3) Jean Georges. 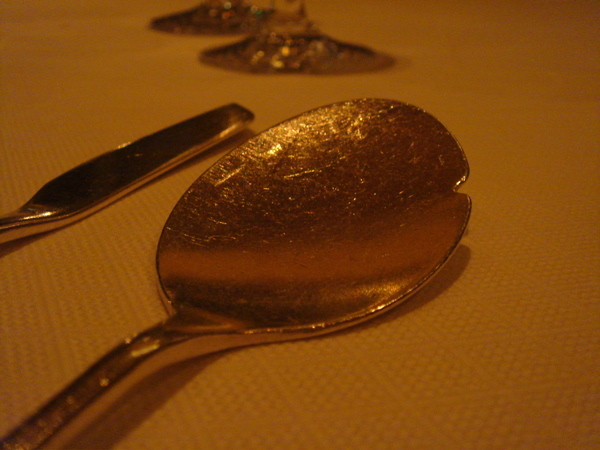 (some New York foodies, including NY Mag critic Adam Platt, may throw Le Bernardin in the #1 spot. So why not try them all!